Voices in Harmony is a 40-member women's a cappella chorus from Ypsilanti, Michigan. Since 1975, the chorus has provided Southeastern Michigan with the highest quality a cappella and barbershop harmony through performance, education, and community service. Affiliated with Sweet Adelines International, a worldwide singing organization for women, they are a nonprofit organization providing educational and innovative entertainment with a variety of music sung in 4-part harmony. Voices in Harmony has found a perfect blend of being a fun-loving family and skilled performers. They strive to be excellent singers and performers who understand the importance of laughter and friendship. Four-part barbershop harmony spans the entire vocal range and is perfect for the average singer who longs to be part of an ensemble where she will be valued without consideration of age, ethnicity or physical limitations. Acceptance in the chorus is assessed on the ability of the singer to match pitch, independently carry her own part and blend with the ensemble. 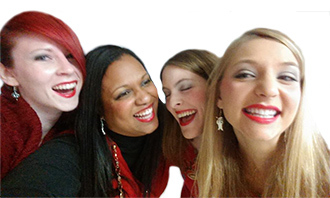 Quality a cappella harmony, fun and friendship for women! We will develop the knowledge, skill and experience to perform at our highest desired level, both individually and collectively. We will operate with the philosophy, processes and practices that will enable consistent, long-term achievement of our goals and increasingly higher levels of performance. We will experience lasting relationships of goodwill, rapport, caring, loyalty and love. We will create a culture that enables, inspires and celebrates joy and laughter. We will build and maintain a welcoming and nurturing environment which fosters respect, acceptance and involvement of all despite differences in age, ethnicity, background and personal characteristics. We will create a total chorus experience of value and excellence in all things to our members, our families, our communities and our organization. To learn more about us, visit a rehearsal anytime!